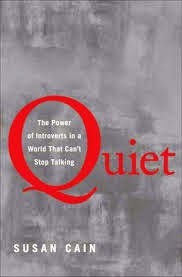 I've been reading "Quiet: The Power of Introverts in World That Can't Stop Talking" by Susan Cain. I've seen her TED Talk on introversion and have seen several quotes from this book and decided I needed to read it. I really appreciated her addressing introverts in evangelicalism (although, I don't classify myself as an evangelical, I grew up in that environment and still come in contact with it frequently). I'm only halfway through the book, but it finally prompted me to write this post about introverts in Western Christianity I've been completing for some time. It's interesting how people now tend to measure a person's faith by how many people they "minister" to (minister meaning talking to them gregariously about faith), how friendly they are during "meet-and-greet" time, how many groups and programs they are involved it, and how loudly they sing, pray and generally how out-going they are. There was a time when piety was measured in quiet devotion, contemplation and prayer. It should then be no surprise that the average introvert feels isolated and dysfunctional in large, loud group church settings. But quiet does not mean disconnected, lack of involvement in programs does not mean lack of growth. Introverts tend to grow and learn the best in solitude; they have the capacity to challenge themselves and this typically inspires genius creativity and breakthroughs of thought. This is something which the modern church has simply ignored, favoring bringing people together in some sort of forced "community". Typically, only extraverts tend to thrive in that environment, leaving the rest of us on the sidelines feeling as if somehow our faith is inadequate because we don't long to socialize ("minister") as much other congregants. This is something I've long made peace with. We attend a church service occasionally. But for the most part, my faith is a quiet walk with God. Not quiet as in ashamed, but quiet as in peaceful, introspective. And it's possible to "minister" in ways other than verbal proselytizing, something at which I'd simply be inefficient. The fact of the matter is, although God likes to test my limits and I try to be flexible and grow, He created me to introverted and loves my personality whether or not it looks like magnetic personality leading a song service or Sunday school class.